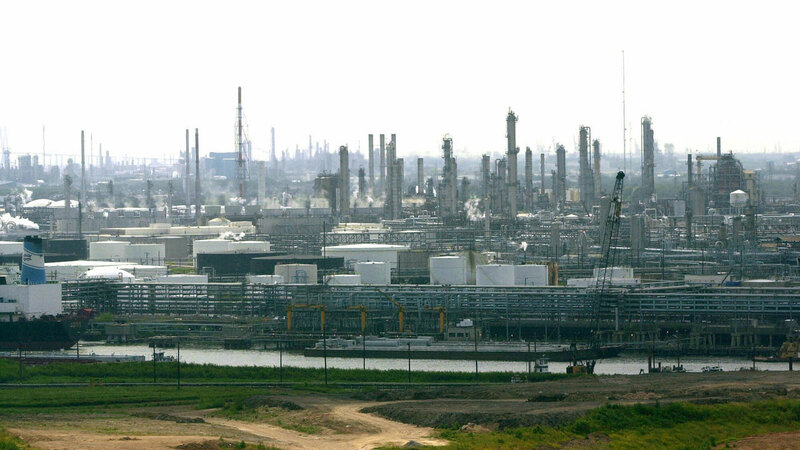 HOUSTON -- Houston's efforts to use local clean air laws to regulate pollution in the home of the nation's largest petrochemical complex were halted Friday by a Texas Supreme Court ruling in favor of energy and chemical companies that claimed the city had overreached. The coalition made up of ExxonMobil Corp. and other companies with nearby refineries and plants had sued the nation's fourth-largest city in 2008 after Houston passed ordinances that required businesses to pay registration fees based on the number and type of pollution sources on each site. The city used the fees to investigate potential violations of air pollution laws. The ordinances also made it unlawful to operate a facility inside Houston unless it was registered with the city. Violations of the ordinances could have been prosecuted in municipal court and were punishable with fines between $250 and $2,000 per day. Attorneys for the city had argued in court documents the ordinances were a local expression of state laws regulating pollution, that they didn't make an "end-run" around state regulations and the lawsuit was hiding the real issue, "which is that industry does not want to be accountable to the people to stay within industry's permitted levels of pollution." But in a 8-1 ruling against the city, the state's all-Republican high court said the ordinances were inconsistent with the Texas Legislature's intent that favored statewide consistency in enforcement. The Texas Commission on Environmental Quality is the agency in charge of administering the state's environmental laws. The Supreme Court said the ordinances allowed criminal prosecution without letting the environmental commission determine if a violation had taken place and without allowing the agency to determine if administrative or civil penalties were more appropriate. "The Legislature has enacted a comprehensive and flexible regulatory regime for investigation into possible violations ... and consistent enforcement of the state's air pollution laws," the high court wrote. Houston City Attorney Donna Edmundson said in a statement that the ruling would not "dampen the city's efforts to assist the Texas Commission on Environmental Quality in abating air pollution." "The city will employ other legal mechanisms, including those allowed under the Texas Clean Air Act and Water Code, to monitor and take action against those who pollute the city's air in violation of state and federal air pollution control laws and regulations," Edmundson said. Evan Young, an attorney for the Business Coalition for Clean Air Appeal Group, said he was pleased with the ruling. "We think it upholds the integrity of Texas environmental law and reaffirms the important role for clear, even-handed statewide regulation," he said. If Houston's ordinances had been upheld, it would have created a patchwork of such laws across the state that would have allowed counties or cities to "establish their own priorities and their own determinations of when to try and bring a particular kind of enforcement," Young said. Adrian Shelley, executive director of Air Alliance Houston, an environmental group that had filed a motion in support of the ordinances, called the ruling "bad news for public health in Houston." He said the court's decision falls in line with recent actions by the state - including a law last year barring local ordinances that prevent fracking and other oil and natural gas activities that are potentially harmful to the environment - that erode Texas residents' rights to seek environmental and public health protections. "We don't have enough resources for enforcement and as a result, we have levels of pollution that endanger public health and do not comply with state and federal standards," he said.